Choices. Having a choice is (almost always) a good thing. Everyone likes to have a voice. It’s a control thing really. Choices allow us to charter our own ship. With a choice in hand, we’re the captain….the cruise director…and the world is our oyster. “Offering choices” is a hot-button parenting strategy. We’re told to offer choices in everything from what outfit they’d like to wear to school to what they’d like for an afternoon snack. In some scenarios, I think choices are great. 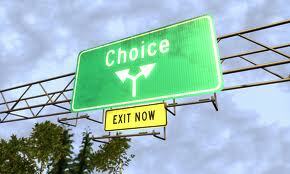 Choices teach our children decision-making. Granola bar or fruit leather? Where the Wild Things Are or Arthur’s Eyes? Simple and controlled choices help children feel valued and important. Choices help our children use good judgement and determine preferences. A choice between two predetermined selections can be a great strategy. Offering a choice when there isn’t one (or shouldn’t be one) is another animal altogether. In the name of “offering a choice” so many parents are choosing to fail. These are choices that should NOT be offered. We’ve come to the wacky conclusion that “good” parenting means putting all of the control in our child’s hands. What we are failing to remember is that WE are the ones in the driver’s seat. It’s our job to keep our children on course. Everything isn’t a choice. There are times when we absolutely must tell….and not ask. If you ask your child, “What do you want for dinner?” or “What do you want to do on Saturday afternoon?” you had better be okay with whatever they come up with. If you’re constantly offering a choice and shooting down their response, your child will quickly learn that your words can’t be trusted. They’ll become frustrated and irritable….because you offered a choice when a choice didn’t exist. You can’t offer control when it’s not up for grabs. You find yourself in a lose-lose situation. Instead, offer a controlled choice. Say, “Do you want tacos or spaghetti for dinner?” or “Would you rather go to the park or the library on Saturday?” Predetermine a few workable and doable choices and offer those. This ends up in a win-win. Something you deemed acceptable was selected, and your child feels valued and in control. Controlled choices are the Cadillac of choices. Things like bedtime and homework should be non-negotiables. Asking a four year old if they’d like to go to bed is a ridiculous question. Bottom line? Don’t offer a choice when there shouldn’t be one. Remember that YOU are the parent. It doesn’t make you a bad parent to tell your child what to do…that’s your job! So, go ahead and TELL your child that it’s time to sit on the potty, take their bath, and wear their knee pads when they roller-blade. Keeping your child safe and healthy, and helping them learn to obey and respect your authority are GOOD things. If this is new to you, expect resistance at first. Hold your ground. Be consistent and follow through. It may be tougher in the short-term, but good parenting will pay off. Do you want to practice controlled choices with your children this week? The choice is yours. Choose wisely.